One bacterial pathogen is responsible for a range of diseases, from pharyngitis and impetigo to more severe diagnoses such as toxic shock syndrome and necrotizing fasciitis (flesh eating disease), a serious bacterial skin infection that spreads quickly and kills the body’s soft tissue. The pathogen, known as Group A Streptococcus, remains a global health burden with an estimated 700 million cases reported annually, and more than half a million deaths due to severe infections. The ability of Group A Streptococcus (GAS) to induce rapid destruction of red blood cells has been observed for more than a century and remains a clinical hallmark of GAS diagnosis. This destruction is due to the production of a small peptide toxin by GAS known as Streptolysin S (SLS). 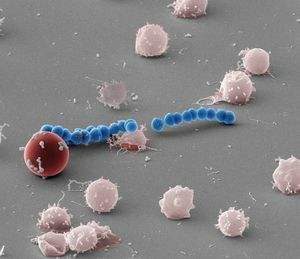 Although it has been widely held that SLS exerts its lytic activity — the excessive destruction of red blood cells — through membrane disruption, its exact mode of action has remained unknown. In a new study, Lee’s research group provides the first real-time, high-resolution observation of Group A streptoccocal red cell destruction, also called beta-hemolysis. Importantly, chemical inhibition of Band 3 function completely blocked the hemolytic activity of SLS, and significantly altered the pathology induced by GAS in an in vivo skin infection model. “Our studies provide the first mechanistic look into the longstanding question of SLS function and, importantly, open new therapeutic avenues for the treatment of severe GAS disease,” Lee said. “This was a wonderful collaborative effort led by Dustin Higashi, a senior researcher in my lab, to try to answer the longstanding mystery of how this very powerful toxin known as Streptolysin S lyses red blood cells to contribute to invasive human disease caused by the Group A Streptococcus,” he said. The study was supported by an NIH Innovator Grant awarded to Lee and appears in the journal Nature Microbiology. It can be found here: http://www.nature.com/nmicrobiol/. Originally published by William G. Gilroy at news.nd.edu on January 28, 2016.